Saccon's L14 brake levers are adaptable for use with all bicycle cable braking systems. 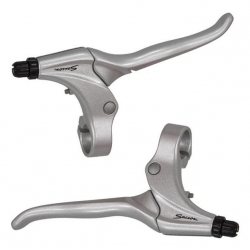 As delivered these brakes are set up for use with traditional side-pull, centre pull, cantilever and mini-V rim brakes, drum brakes and Shimano's roller brakes. The mechanism can be adjusted by moving a small lever inside and the accompanying piece of plastic which holds it in place so that they brakes are compatible with long pull brakes such as most V-brakes. See additional images for a photo of the mechanism. Delivered as a pair for left and right. It is possible to adjust one side only if you have a bicycle with a combination of brakes, e.g. V-brake at the front and drum brake at the rear.